Once Zend Guard 5.0.1 installs successfully on Mac OS X 10.6, it is possible to launch newly installed Zend Guard from the last installer screen. However, any subsequent attempts to launch Zend Guard from the created showill fail with JAVA exception window. This problem occurs due to the requirement of Zend Guard GUI to run with JAVA 32bit while the Mac OS X JAVA is set to 64bit by default. 1. Look for JAVA Preferences in the Mac OS X help search and launch it. Help search is located in the top right of the system panel under the magnifying glass icon (near the clock). 2. 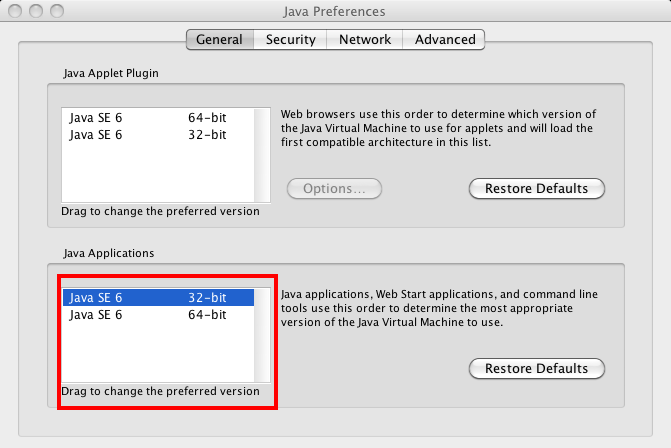 Drag the 32bit JAVA above the 64bit JAVA in the "JAVA Applications" section (the bottom section). The "JAVA Applet Plugin" section is not relevant and you may leave the JAVA 64bit above the JAVA 32bit. 3. Close JAVA Preferences (if you leave it open it will have no effect on Zend Guard launch. 4. Try to launch Zend Guard. 2. Edit ZendGuard.ini in a plain text editor. 5. Try to launch Zend Guard. This great tip about ZendGuard.ini was suggested by one of our Zend Forums community members. Excerpt: How to make Zend Guard 5.0.1 run on Mac OS X 10.6.